In less than two years, I needed two major surgeries. The first time, in 2009, I had lung cancer and had to have a section of the lung removed, so I really needed someone to care for me. I couldn’t afford a private duty nurse or home care. My daughter Tahearrha volunteered, but she couldn’t take extended leave, just a day here and a day there. It did help that she could be with me when I went back and forth to doctor appointments for biopsies and other tests, but she was there only part of the time, and that was hard. The following year they found tumors in my ovaries and I needed a total hysterectomy. Because of the kind of personal care I needed, I wanted somebody I was comfortable with. I am a unit coordinator at Rutgers University. I do a lot of dispatching for emergencies on campus. I’m also vice president of my local union. At some point I went to a workshop and heard about the Family Leave Insurance program. I asked my daughter to find out if this was something she could do on her job – and it was. With the extended leave for the second surgery, she could afford to be there with me all the time. She knew me, knew my tastes. I feel I healed faster because she was there. Most of my family have the types of jobs, if you don’t go to work, you don’t get paid. So this made a big difference for their peace of mind as well. 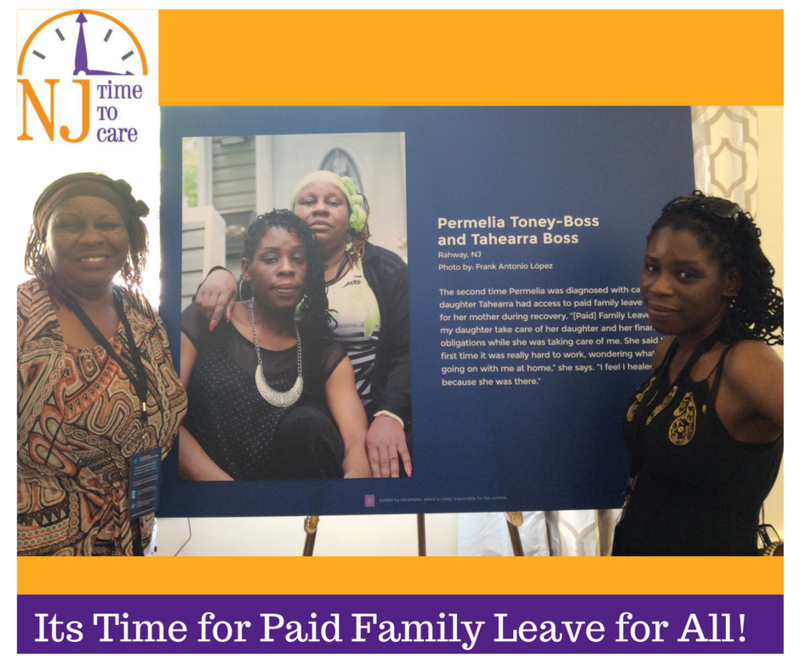 Family Leave Insurance helped my daughter take care of her daughter and her financial obligations while she was taking care of me. She said the first time it was really hard to work, wondering what was going on with me at home. I know what this is like from the other side as well. I took care of my sister and my mother – each of them died of cancer. When that happened, I used up all my vacation and other time. They were always telling me they felt more comfortable, even safer, that I was there. That’s how I felt with my daughter. It helps to have someone who knows your wants and your needs. And it helps with the stress as well. When you get that kind of news, it’s really hard to digest – and then you have to turn around and explain it to your family members. It’s devastating. You have surgery and don’t know if you’re going to wake up. You feel your life is over – I wasn’t ready to go, I have children and grandchildren. So having someone who really knows you take care of you makes a big difference. With my sister and my mother, I bathed them and stayed overnight in the hospital. My daughter did the same for me. I know the nurses appreciated it, too – they could spend more time with other patients. The fact that the time is paid gives you the opportunity to care for your loved one as well as the opportunity to care for yourself and your family. You can continue your life, pay your groceries, pay your rent and still provide that care. It relaxes you -- you’re sure the person is getting the care they need because you’re giving it. If there’s some way you can make it possible for this to benefit people in other states, it would be extremely beneficial for families, especially poor families, so they can care for a loved one and still carry on their obligations at home, instead of having to sit at their job and wonder when the phone is going to ring, what they’re going to hear. When you’re going through what I’ve gone through, the one thing you really want is someone you’re comfortable with, someone you know cares about you and your well-being. Family members need to be able to afford to be there for that person.